Alright, 2017, let’s get you started and over with. I can feel you are gonna be one of those years, aren’t you. One of those ones with four numbers in them. 2016 was just a warm-up. Anyway, here in California we have rain, and lots of it – more than we have had in years. We need it after this drought. I remember big storms and floods in this area when I first moved here, and apart from the odd storm here and there they have never been matched, but these come close. We have had it good though; in Natomas, they had a tornado touch ground a couple of days ago. 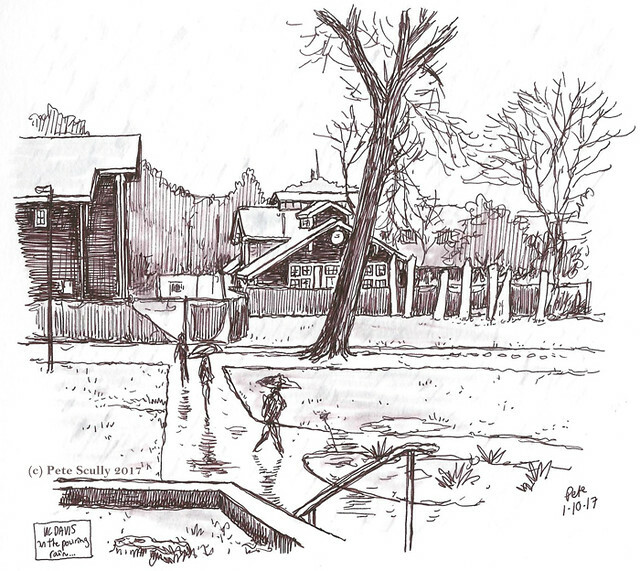 These were drawn in between those days, the top one being of the steady rain on the UC Davis campus. 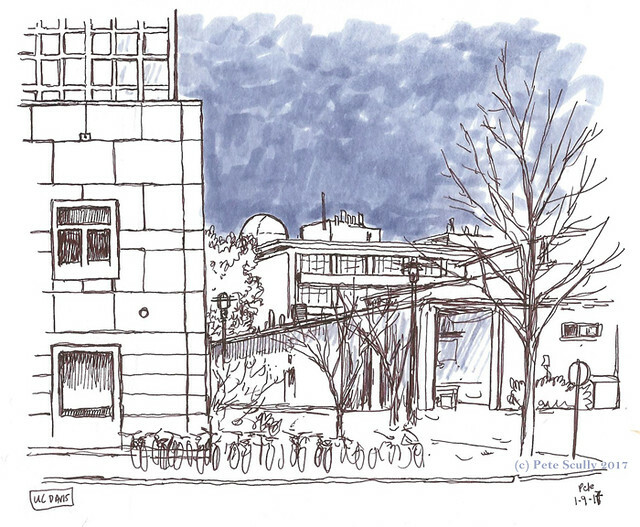 I stood beneath the shelter of Bainer Hall to sketch, a spot I have sketched from too many times to count now. Below, I forget the names of the buildings in the foreground, Sciences Lab and I think that’s the back of Haring, but you can see the observatory on top of, er, is that Hutchison? Am I pretending not to know, that is the question. Of course I do, I’ve been on campus for years. But look at that sky! Look how dark it is, dark and foreboding, like around the castle of the Skeksis at the start of the Dark Crystal. There was no lightning though, just dark, heavy, you might say grumpy clouds, moving toward the east. I’m not superstitious, but oooh, a big storm. I have done a lot of sketching so far in 2017, mostly of Lego Star Wars vehicles, you will see some of those soon. In the meantime, dark brooding malevolent skies. And science, surrounded by lots of good science. Also, the way the wind blows does matter to me, very much.